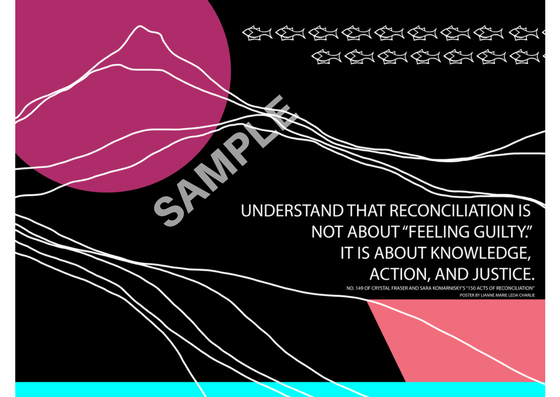 Limited edition of 20 posters featuring text from 150 Acts of Reconciliation and artwork and design by Lianne Charlie. Each poster measures 15x20". Beautifully screenprinted by hand in full colour at SNAP (Society for Northern Alberta Print-artists). Price includes shipping within Canada. Local pickup available in Edmonton. These special edition art posters will help us raise funds to support our ongoing work. Send an e-transfer to 150acts@gmail.com. When you send your e-transfer make sure to indicate the posters you wish to purchase (Art poster - "Reconciliation") and provide your name, mailing address, and phone number.